Looking to scare your family with some scary Halloween prank? or just want to scare your annoying neighbor? then this scary tapping peeper is the perfect way to do that. 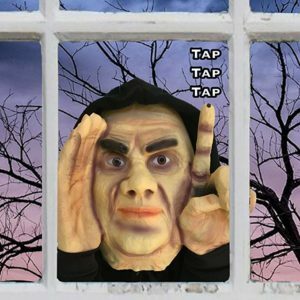 This scary tapping peeper has a motion detection sensor which activates when there is a movement in the room and automatically starts tapping on the glass or surface it’s attached to. Just place it on the window of the room your victim frequently visits and watch them scream at the top of their lungs. The sparkling lifelike eyes and head size takes the horror to the next level, making sure the victim doesn’t doubt they are being pranked. This is the best toy to fool or scare your friends this Halloween or just to play a prank on your friends when you’re bored. Scary tapping peeper is present on both Amazon USA (Amazon.com) and Amazon UK store for our readers. Click the button below to buy from your country’s Amazon website. For Australian and Canadian readers please visit the Amazon USA store to get the best rates.